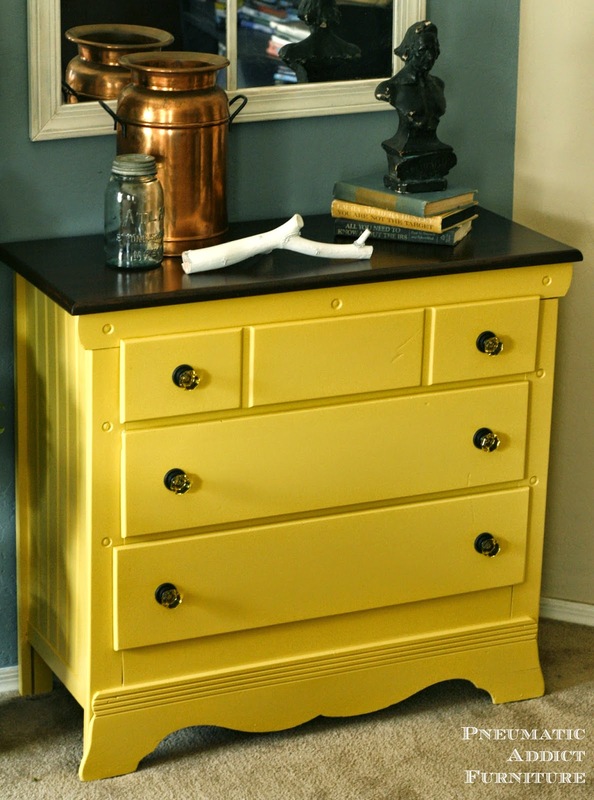 In Tuesday's post, I showed a couple photos of my latest furniture make-over. By the way, the giveaway is still running till Monday, September 1st, so head over here and enter for a chance to win a *Finish Max Pro paint gun . 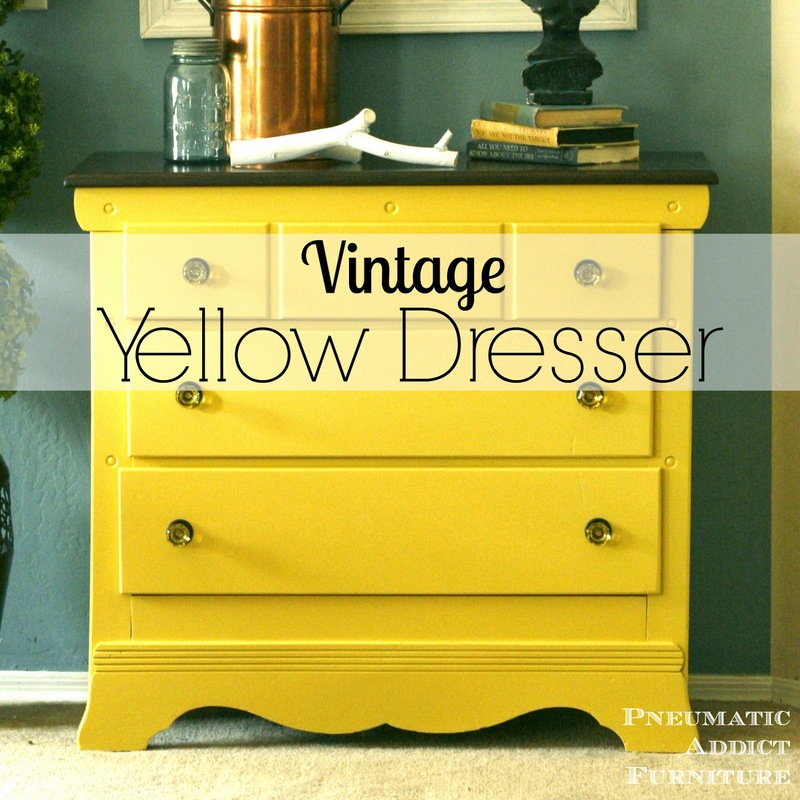 Today, I thought I'd share a few more shots of this little, vintage dresser with you. I picked up this piece last year from a friend who was flipping an investment property. The previous owners had left a bunch of stuff, so I swept in bought all the good furniture. Other pieces from this house were my Computer Armoire with a Twist, and the Updated 90's Dresser. 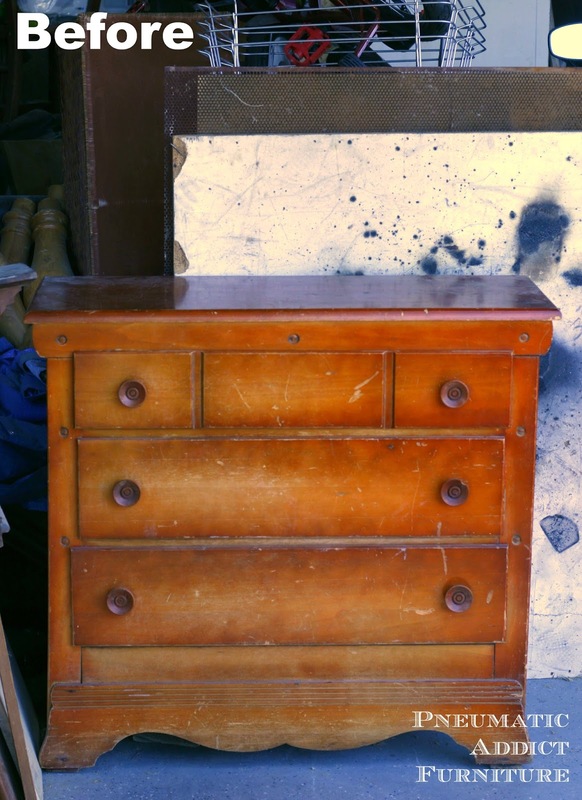 Anyways, this little, maple dresser sat in my garage, unloved for many months. It really needed some repairs. When I received my Finish Max Pro from HomeRight, I knew it was time to update this piece. 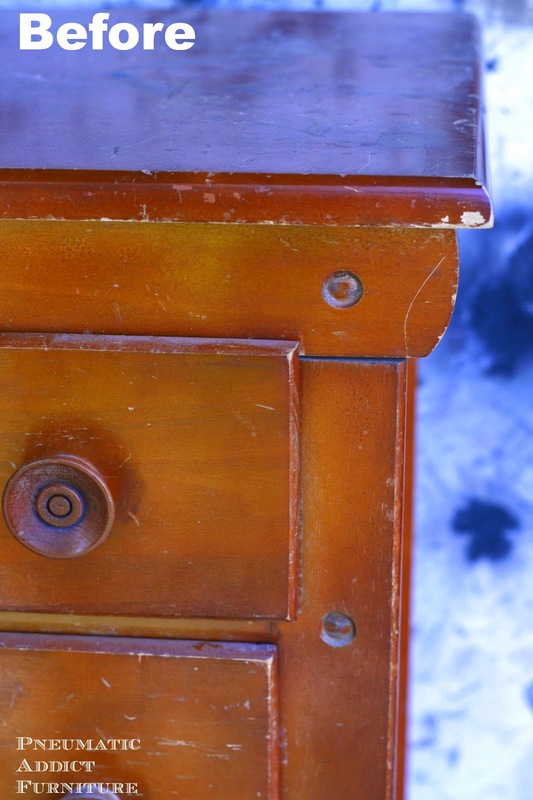 The first steps were to make repairs to the drawer slides and replace the backing. For fun, I added a bit of bead board to each side. The top was sanded and stained. If you have ever stained maple before, you know it's no picnic. Even when using a pre-stain conditioner, maple is notorious for taking stain unevenly and looking blotchy. That's exactly what happened with this dresser. After re-sanding and re-staining twice, I decided to leave it how it was and let the stain dry overnight. The next day, I brushed on 2 coats of DIY wood toner. Worked like magic! The color was no rich and beautiful! I sealed the top with 4 coats of Polyacrylic, and let it cure for a couple days. Time to paint. I taped and papered the top to prevent over-spray and mixed up my paint. Notice how orange the original stain was? That's a big bleed-though warning. Stains with a lot of red or orange (especially old ones) are loaded with tannin. Tannin is the nasty, pink-orange stuff that will raise to the surface of your beautifully painted piece, sometimes years later. The ONLY product I've discovered to truly stop tannin bleed is shellac. You can buy it in *brush or *spray form, and occasionally you can find a primer that is "shellac based". 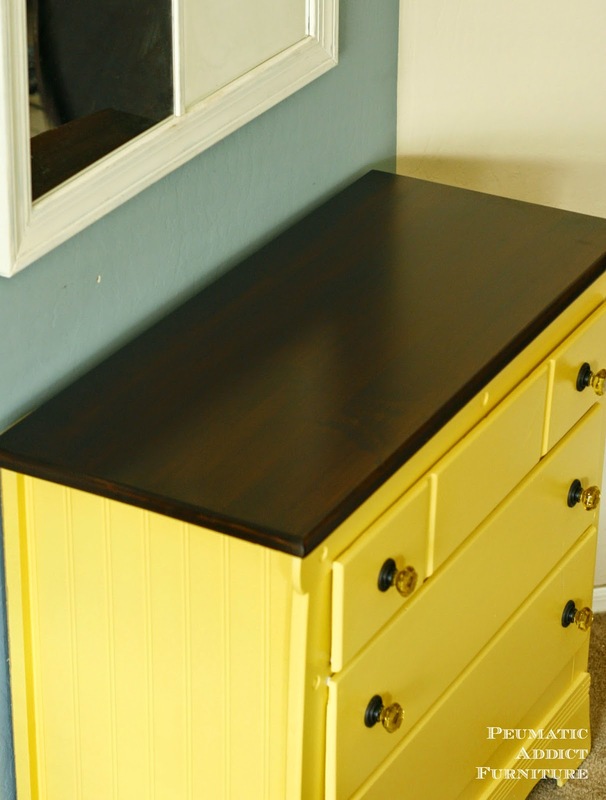 Knowing this dresser screamed "tannin bleed", I sprayed a coat of shellac over the entire body and all three drawers. 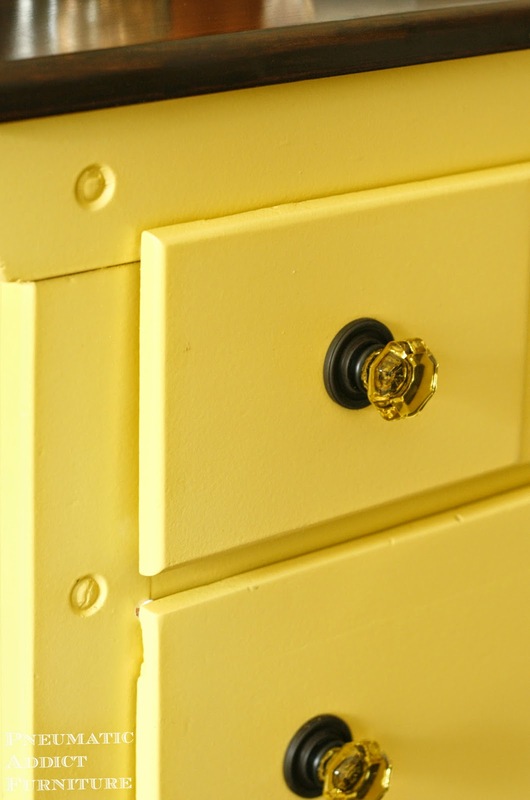 Normally, I only paint the drawer faces, but whoever stained this piece the first time was sloppy and there was orange over spray all over the drawer boxes. Luckily, shellac dries very fast, and I was able to spray a coat of *water based primer about an hour later. Two coats of yellow paint, and three coats of Polyacrylic later, here is the final look. 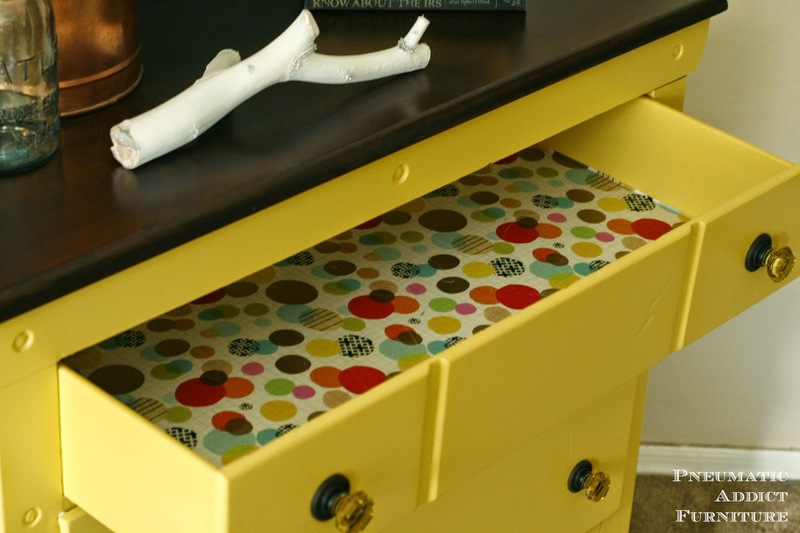 I Mod-Podged some colorful wrapping paper inside the drawers to spice things up. How gorgeous are these knobs? I've been dying to use some colored glass knobs forever. I received these champagne cut glass knobs and oil rubbed backplates from my favorite, D. Lawless Hardware. FYI: The whole in the backplates were not large enough originally to accommodate the knobs. I had to drill out the opening larger before they could work together. What do you think? If you love it, it's available under the "Shop" tab. Remember, click here to enter the Finish Max Pro giveaway! 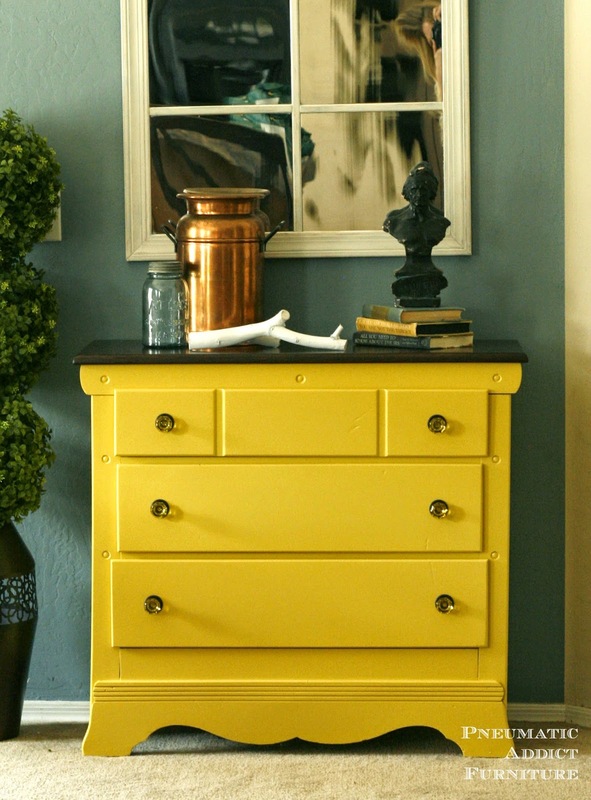 Your dresser turned out amazing. Thanks for all the helpful tips working with Maple. How light a spray do you use for the final coats of Polyacrylic? Clap! Clap! This is just an amazing work of art! It looks very appealing to my eyes. By the way, I found some good furnitures here. We inherited an old dress from my grandfather's estate, and it would look fabulous painted! I'm also working on a small side table to put our plants on in the front room, it would look really cut if painted too. 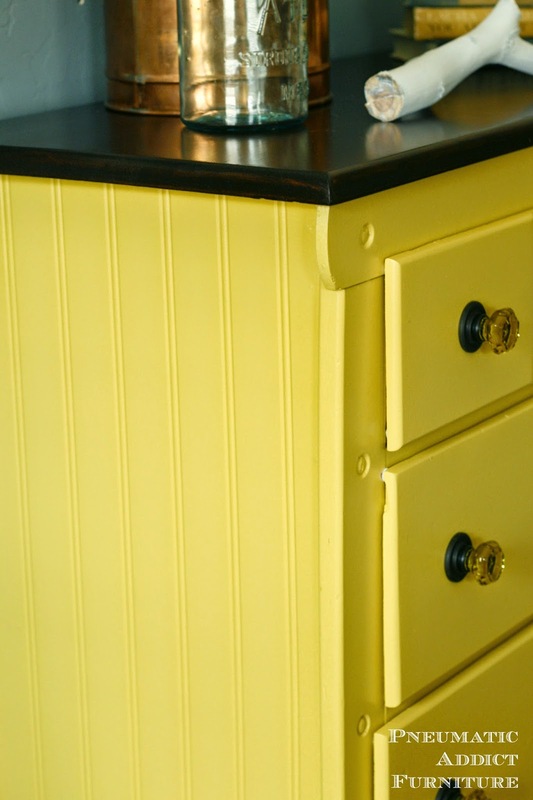 This came out gorgeous, do you mind sharing the brand and color of the paint and stain you used and the brand of the polyacrylic? This project of yours is truly an inspiration to me. Thanks! Thanks Trish! The stain was Special Walnut by Minwax, but looked very different till I added the coats of wood toner. The wood toner added a lot of depth and richness to the stain. Here's the tutorial to mix your own wood toner http://www.pneumaticaddict.com/2014/08/how-to-make-wood-toner.html. The paint color was an "oops" paint from Home Depot. Sorry, I don't have a name. Forgot to mention, the Polyacrylic was also Minwax. So pretty, Elisha!! LOVE everything about this! !